Huh? What Inglis means by “accountable free enterprise” is a carbon tax. Republicans “won the majority in the Senate and increased their majority in the House” despite Tom Steyer, Environmental Defense Action Fund, NRDC Action Fund, League of Conservation Voters, and Sierra Club spending an unprecedented $85 million to elect ‘climate champions’ and unseat ‘climate deniers.’ Consistent with survey research finding climate change to be among voters’ lowest priorities, the election results indicate that Republicans are less vulnerable than ever to green attack ads. So why is now the time for a Constructive Republican Alternative Proposal that would raise energy prices, deny Americans the benefits of affordable, plentiful, reliable coal-based power, and have negligible impacts on potential climate change? Suppose the attacks had worked, and the GOP sustained huge losses; what would Inglis say then? Very likely, ‘I told you so.’ He would blame Republicans for failing to offer a ‘free-market’ solution (viz. carbon taxes), leaving voters no choice but to support Obama’s climate policies. Now more than ever, he would undoubtedly say, Republicans need to rally round the carbon tax or become irrelevant to the national debate. In short, from opposite results, Inglis would likely draw the same conclusion. In a recent (Nov. 10) Weekly Standard article, R Street Institute President Eli Lehrer also speculates about the prospects for a “conservative” carbon tax in the new (114th) Congress. Like Inglis, Lehrer defines a “conservative” carbon tax to be one that is revenue-neutral (offsets other taxes dollar-for-dollar) and replaces EPA’s greenhouse gas regulations. Even with all of these inducements [revenue neutrality, replacing EPA’s GHG regulations], it’s unlikely the conservative grassroots will embrace a carbon tax. No more than 2 percent of voters—nearly all of them on the left—tell Gallup pollsters the environment is their most important issue. Even environmental voters, furthermore, tend to be far more concerned with water and air quality than climate change. Conservatives won’t make many sacrifices to get their [actually, his and Inglis’s] desired climate policies because few voters—and almost no members of the conservative base—care about the issue. I am reminded of a scene in Plato’s great dystopian dialogue, The Republic. In Book VII, young Glaucon asks Socrates how a regime of complete communism ruled by philosopher kings could come into being. Socrates says the philosophers would begin by expelling all the inhabitants who are more than 10 years old, so the children’s moral formation would not be contaminated by their unwise parents. But how on earth would a small group of eggheads persuade all the parents to abandon their children? Even more problematic, how would your average parent persuade philosophers to abandon their speculative pleasures to take on numerous mundane (and often onerous) tasks such as baby-sitting hordes of other people’s children, running the school cafeteria, and fixing the sewers? Before being persuaded of the desirability of founding the “virtuous city,” each side would have to persuade the other. In other words, for communism under the rule of philosopher kings to begin, it must already have begun. It is an impossibility. A similar conundrum confronts advocates of a revenue-neutral, Massachusetts v. EPA-overturning, carbon tax. Conservatives would have to persuade environmentalists, but only if environmentalists first persuade conservatives — and vice versa. But all of these possibilities would require those on the left to come to the table by giving up their own dreams of recycling carbon tax proceeds into “green jobs” schemes and other boondoggles beloved of progressives. Some environmentalists [who?] 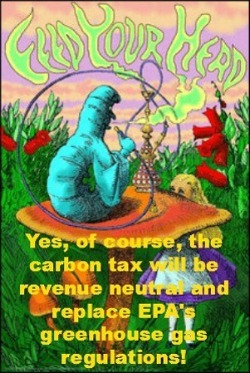 are on board with the notion of a revenue-neutral carbon tax (although many insist on difficult-to-administer schemes that would provide a “dividend” to taxpayers), but that cohort shrinks significantly when it’s proposed that the tax replace EPA regulations, much less preempt energy-related regulations like fleet fuel-economy standards for automobiles. Lehrer continues: “While there are reasons to question the court’s ruling [in Mass. v. EPA], it will be nearly impossible to overturn.” It was impossible under the leadership of Harry Reid and Barack Obama. Overturning is possible only if affordable energy advocates win a clean sweep — House, Senate, and White House — in 2016. But if we get that, we won’t need to give ‘progressives’ the booby prize of a carbon tax. And in any event, litigation should be able to defeat the Clean Power Plan, the centerpiece of Obama’s climate policy, because it is so legally flawed. Thus, for conservatives, among whom Lehrer and Inglis count themselves, conservative victory in 2016 is the only objective worth pursuing. It’s a sheer waste of time and talent to pursue a deal that requires each side to persuade the other to accept a compromise acceptable to neither. So why am I taking the time to debunk a pipedream? Two reasons. First, advocacy of this ignis fatuus keeps carbon taxes in the news and fosters the illusion of significant bipartisan support. It increases the likelihood of a future budget deal in which ‘progressives’ snooker conservatives into supporting a carbon tax that “enhances” federal revenues (increases the overall tax burden) and augments rather than replaces EPA regulations. Second, it diverts significant analytic and marketing talent from the pursuit of genuine free-market energy policy reform in 2016 and beyond.